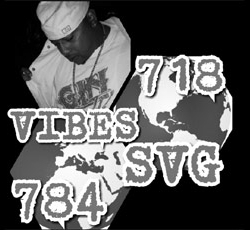 VIBES/SVG is a reggae artist, soca artist, song writer, actor, promoter, television host and more. This talented artist fromEast Flatbush, Brooklyn, brings a flavor and style that compares to no one. Sneaking out to parties as a teenager, SVG found the world of dancehall reggae and soca music. He’d learned many of skills sittin’ in wit DJ’s and far from a new comer in the game. He has performed many show cases in NYC as well as The Elite Ark, The Warehouse (BROOKLYN), China Club, Club Downtime, Speed (MANHATTAN), Amurzura (QUEENS), Caribbean City, Squads, Tropical Reflections, the Palm Resort, and many more just to name a few. He performed on stage in Jersey, Philly, Virginia, Miami, Washington DC, NC, SC, Atlanta & over seas Islands such as Barbados, St.Vincent & Puerto Rico. SVG has opened up for such artists as Jim Jones, Missy Eliot, Olivia, Shaggy, Joe, Chico Debarge, Cecile, JR Rider, Little Mama, The Lost Boys and many more. He has also appeared on local Brooklyn Bcat TV and BET. He is down with GINTV Ent, 3 Times Ent, Hott Vibes Promotions and a member of Nozzle Up Crew (Bruce Almighty, Flossy P), SVG also has his solo songs Like Body That (reggae), LIXX (SOCA), BK Signal (reggae), Position (soca) and Carnival Posse (soca), blasting on local radio stations and many of his videos can be found on a google search. Vibes/SVG host GINTV as well as his own shows. Ms Peggy says, Vibes/SVG is a man you want to check out along wit the artist he produces. Vibes/SVG has his own Legally Loaded distribution system with the ability to distribute any DJ/artist/or promoter’s music along wit any of their products. Don’t forget to shop the mall and Get Legally Loaded wit Vibes/SVG. When you buy a download of music with Vibes/SVG your name and code gets registered in the “Book of Knowledge” that you are Legally Loaded and a part of makin’ history.